From Goodreads: High school is hard enough when you’re normal. There’s peer pressure, book reports, the in crowd and the enormous zit that has a life of its own. Having a family whose skeletons in the closet lean toward the paranormal is not a topper on anyone’s list. Sophomore Kasey Maxwell is busy juggling the typical teen angst. Add visions, ghosts and hairy four-legged monsters into the mix and you get FREAKSVILLE. It’s a wonder Kasey has survived. Every woman in the Maxwell family has the gift of sight. A talent sixteen-year-old Kasey would gladly give up. All she wants is a normal life. Shopping and talking about boys with her best friend and long-time sidekick Gillie Godshall consume her days. Until Kasey has a vision about Josh Johnstone, the foreign exchange student from England. The vision leads her into new waters, a lead in a play, a haunted theater…and into the arms of the Josh. Yet, both Kasey and Josh have secrets lurking in dark corners. 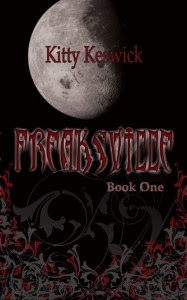 Can Kasey’s new romance survive FREAKSVILLE? I really want to read this too. I also really lvoe the cover! Ooh, it sounds good! I love reading your picks - they're always fantastic! I've never heard of this one but it sounds pretty good. Thanks for sharing! Ok you've peaked my interest. This sounds ace! Definitely going on my wishlist! I am anxious for this book as well.